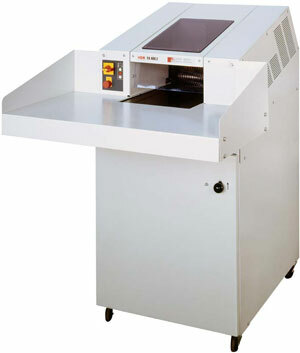 *image shown with optional table extension Designed for large amounts and continuous operation. Material in feed via a conveyor belt for optimum loading and maximum throughputs. Practical loading table for simple loading. Touch-sensitive keypad for continuous and reverse operation. Auto-stop with LED for full collecting bag. Automatic reverse for paper jams. Intake width of 428 mm. Convenient trolley with extremely sturdy reusable collection bag. Very sturdy gear motor with chain drive for maximum throughputs. Transportable on wheels. Container volume: 460 litres, optionally available with 2 collection bags each with a volume of 230 litres for considerably easier handling. 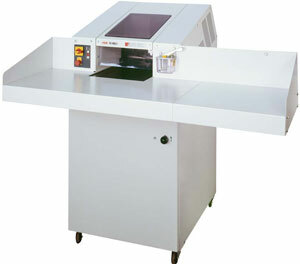 Machine height of 1650 mm. Table extension available as accessory upon request. Shredder care kit by HSM.